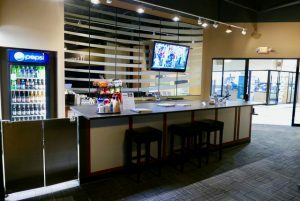 Inside Edge Golf delivers a great experience with 3 different styles of simulators, great food and drink, Wi-Fi, and individually controlled HDTVs. 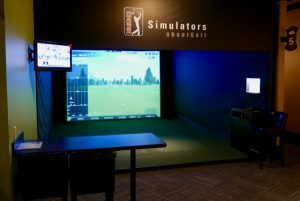 Endorsed by the PGA TOUR, aboutGolf Simulators are the product of more than 30 years of dedicated research and development. The aboutGolf Simulator fully consumes you, drawing you into the experience through unmatched accuracy, living 3D graphics and proprietary Immersive Play Technology™. Our simulators feature over 70 world-famous courses rendered in amazing 3D graphics. Check out the video to the right for a sample! Dial in your distances using any of the driving range modes and the advanced diagnostics. – No metal spikes – soft spikes are permitted. Please clean off shoes (grass, mud, leaves, etc. that may be stuck to the bottoms) before entering the Simulator. – Bring your own clubs. Please make sure club faces are clean. (We are happy to clean them for you, if needed.)  We also have a limited number of rentals available onsite. – We supply specially marked Callaway golf balls. You must use these balls for the systems to function properly. Do not make any additional marks on golf balls as they transfer to, and ruin, our screens. the time that was reserved, regardless of the actual time used. – 1 hr = 1 person for 18 holes once familiar with the system and play. Book some extra time if it is your first time. – No food or drink in the Simulators. – If you must cancel your reservation, please do so at least 24 hours in advance. – Children under 12 years old must have an adult present at all times. – You may be moved to a different Classic Simulator than was reserved in order to maximize scheduling opportunities. Our food is simple but oh so good! We’ve got Hand-Crafted Pizza, Vienna Beef Hot Dogs, Polish Sausage, Sausage/Egg/Cheese Croissants, Seasoned Chicken Bites, Kaufhold’s Cheese Curds, Beer, Pepsi products, Red Bull, Coffee, and snacks all available for you. + No outside food or drink is permitted. + Kitchen closes one hour before scheduled facility closing time. + We reserve the right to refuse/discontinue alcohol service to anyone at our discretion.